We have the ability to choose our home, furnishings and which renovations to implement, but we can’t wave a magic wand around the yard to change the soil type. In San Diego and other parts of Southern California, our soils are composed primarily of dense clay that is back-breaking to dig through whether it’s wet or dry. By understanding the strengths and weaknesses of clay soil and by landscaping with native plants that love it, you can garden efficiently and cultivate a show-stopping yard. Soil that consists of 50% or more clay particles is referred to as heavy clay soil. Clay particles are the tiniest of soil particles with silt intermediate in size and sand the largest. Interestingly enough, clay particles are held together tightly by electrochemical forces which is why it’s found in dense layers. If you live in San Diego, it’s probably safe to assume there is clay soil in your garden, however, confirm any suspicion by performing some tests. Clay soil tens to be tinted red or orange and sticks to shoes if stepped on when wet. Do you see puddling or water run-off in the yard after a rain? 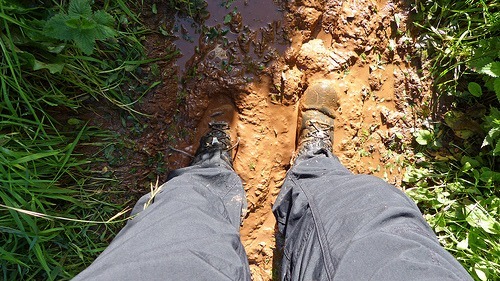 Clay soil absorbs water very slowly and retains it well, causing excess to wash away. Think about the texture of modeling clay and what might happen if you were to dump water on top of it. The majority of water runs off, right? Clay soil behaves in the same manner. Head to your local nursery or gardening center to purchase a soil test kit. Microclimates exist in every yard so be sure to test multiple spots in order to avoid an erroneous result. Note that if the kit needs to be sent away, it could take a long time to receive results depending on how busy the lab is. 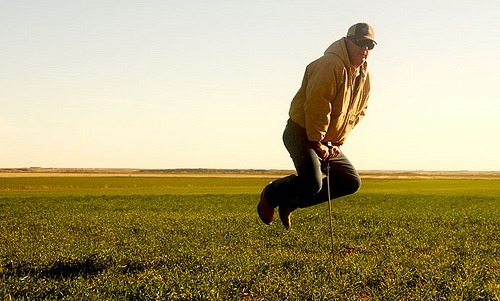 It might just be easier to test the soil yourself with the following method. Roll up a ball of soil (add moisture, if necessary) to roughly the size of a ping pong ball and slowly flatten it into a ribbon. If your ribbon measures less than 1 inch long before breaking, you have loam or silt. If your ribbon measures 1 to 2 inches long before breaking, you have clay loam. If your ribbon measures more than two inches long before breaking, you have clay. UC Davis has prepared an excellent video that not only demonstrates the hand test, but will tell you more than you probably need to know about the soil in your yard. Just for fun, let the kids fill a glass jar with a tight-fitting lid about 1/3 full with backyard soil. Fill the rest of the jar with water, leaving a small amount of air between the lid and the water. Place the lid on and have the kids shake it as much as they like. The soil should separate into layers with sand on the bottom, silt in the middle and clay on top. The small particle size of clay soil means it becomes easily compacted and disallows air circulation as well as good drainage. Trees, such as our native Torrey Pine, and larger shrubs with strong roots can handle clay soil because their roots are able to penetrate through the dirt, unlike weaker plants such as annuals, perennials and vegetables. Do you plant spring bulbs in the fall? In clay soil, these bulbs are likely to rot during the winter as clay retains so much water and is slow to warm in the spring. Because of its density and poor drainage, clay soil retains important nutrients that promote healthy plant growth, however, this means in coastal Southern California it also retains sea salt which is bad, because salt changes the soil’s pH. Also, be careful not to over-fertilize plants as clay soil is already nutrient dense. Unabsorbed fertilizer is not only a waste of money, but it washes off unnecessarily into gutters and then into the ocean, exposing sea life to chemicals. The best thing do to is amend an entire area at once versus just digging a hole and amending the soil around the new plant. The reason is because if the plant grows healthy roots, they will lock themselves into the area of amended soil only and become unable to grow into the denser clay surrounding the hole. As a result, the root will wind around the amended space only becoming a root-bound, weaker plant. Instead, till soil approximately 8 inches down by mixing in grass clippings or compost. Working with clay soil takes effort so skip the gym for the day and use gardening as exercise. Add a thin layer of more organic matter to the top of the best once or twice a year. Occasionally test the pH of the soil bed and add amendments depending on the readings to adjust acidity and alkalinity. Amendments can include builder’s sand, gypsum, composted manure, compost or other coarse organic material and they will add in beneficial microbes while providing for better drainage. Also, some nurseries sell liquid products, like Liquid Gypsum, to help break up clay soil. Over-watering a yard with clay soil is a mistake that many homeowners and gardeners make as the very nature of clay suggests less frequent watering. Rather than running the irrigation daily for short periods of time, the most efficient way to water a garden with clay soil is to water less frequently but deeply, for example, watering twice a day (spaced a few hours apart) just 1-2 times per week. Daily light watering encourages shallow roots because the water stays toward the surface, resulting in a less drought-tolerant plant. If you notice the top layer of soil is perpetually wet, decrease irrigation in the area. It’s ok to thoroughly water newly-planted flowers to settle them into the soil. A layer of mulch over any soil will prohibit weeds from spreading throughout the yard as it prevents seeds from landing on the soil and germinating. Mulch slows water run-off which will help keep walkways, patios and driveways clear of clay mud during the rainy season and spare it from being tracked into your house. The California Native Plant Society is a non-profit resource that maintains a database of native plants, shrubs, vines and trees that will do well in clay soil. 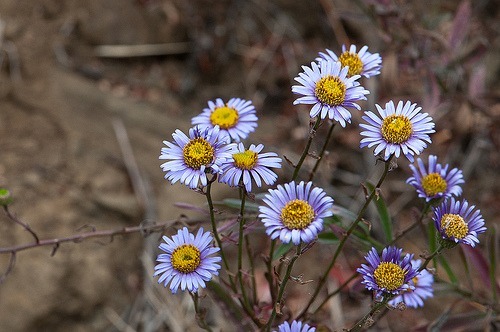 This common aster is a perennial herb that was thought to have originated in Chile, hence the name, and does not grow much taller than a few feet. 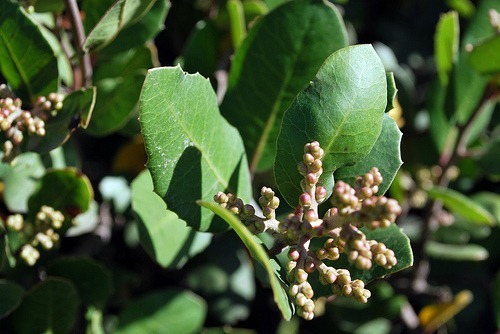 Lemonade berry is a shrub that is found in coastal canyons that can grow from 3-26 feet tall with tiny clustered flowers that bloom in the spring. 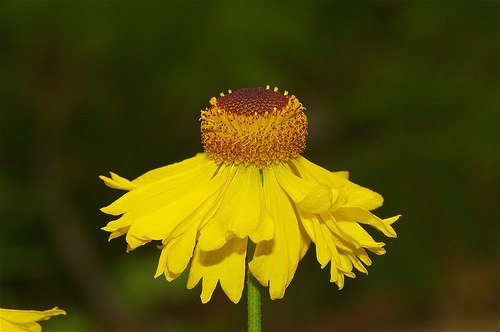 With a sunflower-like head, this branchless member of the aster family grows well in coastal Southern California, but can be found in mountain areas and near streams. 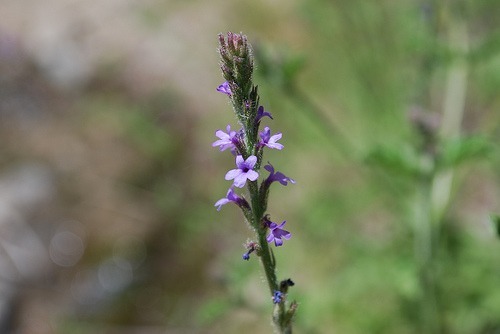 This flowering herb was used to stop bleeding from wounds many years ago and produces stems up to 3 feet tall. Drought-tolerant and deer-proof, this native plant tolerates poor soil conditions and generally grows shorter than 10 feet tall. 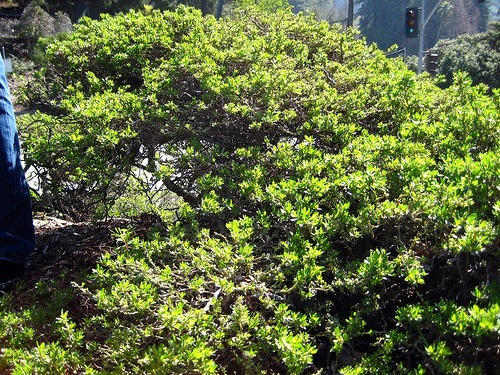 Ceanothus ranges from tall to short but all grow well in clay soil and are excellent for Southern California hillsides as their deep, strong roots help prevent erosion. 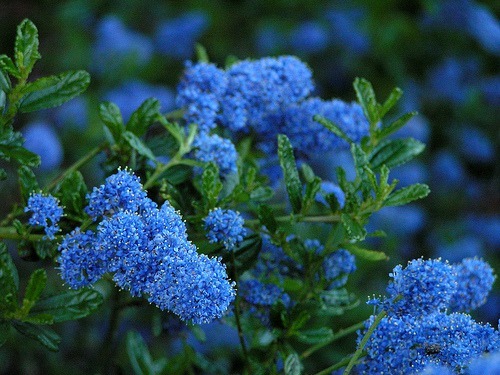 The exact time of year depends on the species of ceanothus but more bloom with blue or white flowers in the late winter and early spring. 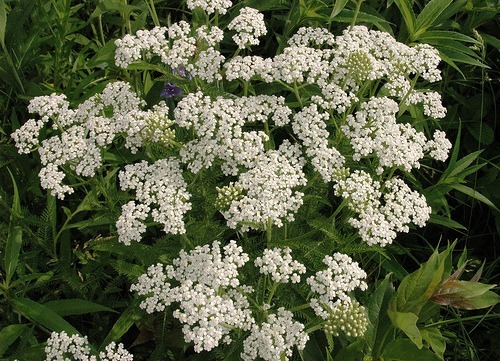 A perennial herb native to the Western United States, butterflies love this plant and beware that it spreads quickly. It’s a popular choice for hillsides. 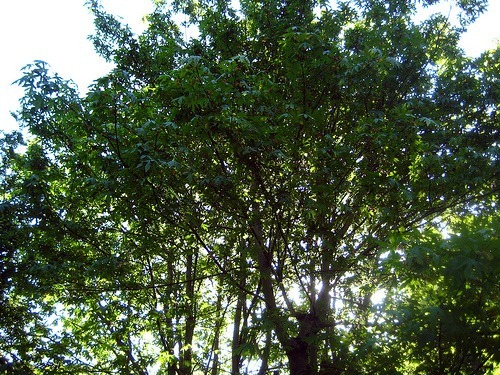 In the sun this tree can grow to 30 feet tall and wide, but it can double its height in the shade with yellow fall leaves. 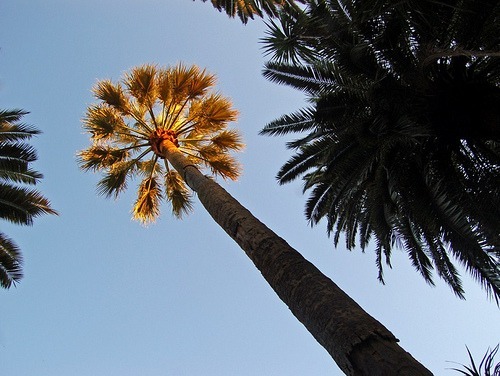 This is the only native palm to the Western United States and a close relative to the Mexican Fan Palm, also seen around San Diego and Baja California. It is tall and can reach up to 60 feet. 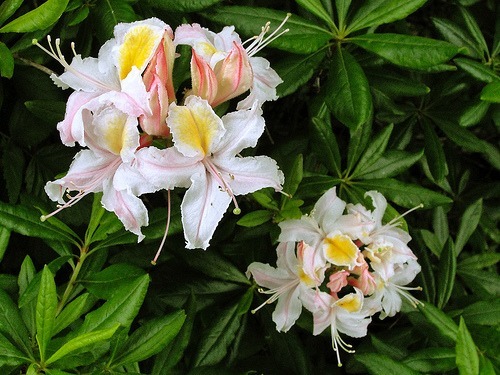 This deciduous small to medium-sized shrub has white or pink fragrant flowers that bloom in early summer. Avoid headaches later by cleaning clay soil off of shoes and tools right away as its sticky nature leads to caked-on mess if left to dry. If you happen to be in one of Southern California’s new housing developments, you may need to seek some professional help if topsoil in your garden was bulldozed during grading of the new home sites, leaving a tough layer of clay exposed. Feeling crafty? Some homeowners report success with making DIY bricks by filling wooden molds with clay soil and drying them in the sun. Just remember that clay soil takes work, but the effort is worth a healthy garden that’s sure to be the envy of the neighborhood.